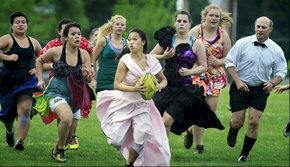 DIY - Prom Dress Rugby Match fundraiser! descended on Lanier Middle School in Fairfax to partake in the area’s first Rugby Prom. T.C. Williams High School rugby coach said the game was designed to help bring awareness about the sport to girls and raise money for local rugby teams. After seeing the event on YouTube and hearing about college teams using the prom game format to promote the sport, they decided to give it a go. It was mainly for fun, but it was also a fundraiser to get some money for the Fairfax girls’ rugby club and help promote the sport. It was just a mix of anyone who wanted to come out and play .. mainly girls from Fairfax and T.C. Williams. Anyone who wanted to come play could for a $5 donation for each player. Wearing dresses and playing rugby didn’t exactly go hand-in-hand, but that was the point. There were some issues with the dresses. Sometimes it was hard to hit full speed running. There was one moment where a ball went into a girls’ dress and they had to stop playing to find it, but that made it fun.